This afternoon, we received a small batch of our gorgeous duvet covers in washed linen which means that the blue grey duvet cover and the vintage pink duvet cover are now back in stock. Once they are sold out, you will need to wait until mid-July for us to get more stock. I’m really really loving this whole linen collection, there is something very soothing about these beautiful linens and I have a massive crush on the soft grey duvet cover which looks really beautifully matched with these pure bright pillow cases. And of course, we have these adorable linen aprons for children like the light grey featured below, which are super nice!! They are available in light grey, blue grey and vintage pink and costs £35 each. 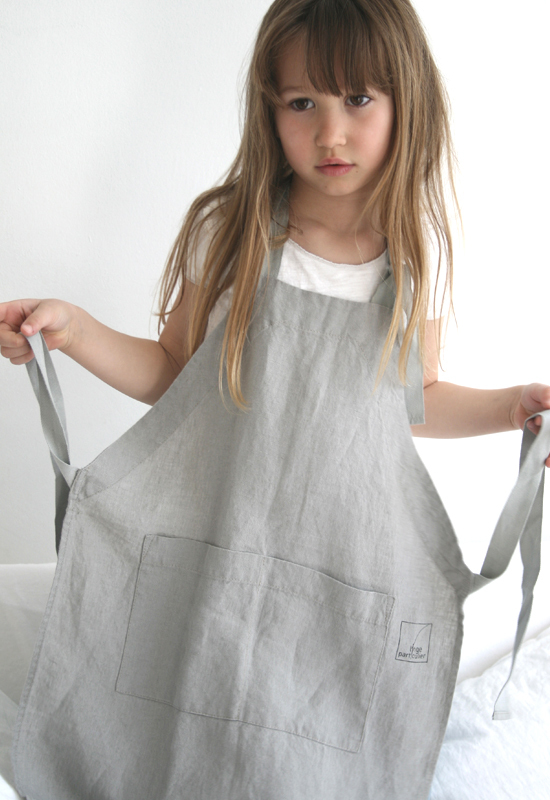 Oh my, that is a mighty adorable little linen apron and it looks good on that beautiful little girl. I would fancy two for my own little girls, only with more color and some fun prints perhaps.